Combining the top of the line S2000 Clearomizer with a robust Variable Voltage Pass-through battery and adding a hard-sided eGo zippered case creates an incredible kit which will provide you with everything needed to relish an opulent, rich vaping experience. We love having choices and even more, we love providing you with choices; so not only are you able to select a color for your case from a myriad of patterns and colors, you also may select which battery size and strength will suite your wants. 1 - eGo Case (Choose One) Solid colors, or designer patterns. Notes: Only use the charging cable that comes with your pass-through battery when charging.Only charge the battery for three hours at a time or you will burn out the battery. The S2000 Dry Herb Wax Atomizer is a five star atomizer made specifically for use with wax, dry herb and concentrate. The S2000 is made of stainless steel; giving it a streamlined, durable look and feel. Along with having clean-cut looks and durability, it allows for easy maintenance and cleaning since the atomizer itself comes apart into 5 pieces. 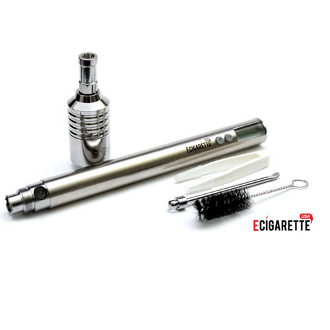 Not only are you able to take this atomizer apart for cleaning, the coil heads are replaceable. Instead of tossing out the whole atomizer and buying another, just unscrew the coil head and replace with a new one. An added feature of the S2000 is that the drip tip is also removable, giving you an opportunity to customize the color and design of the drip tip. With any of our passthrough batteries, they come with an LCD read-out screen, allowing for precision setting of voltages, ranging from 3.0-6.0V, with accuracy within 0.1 V. Other features include a lock-in device for locking in your favorite voltage setting for ultimate flavor and vapor. Remember to turn your battery off when not in use. Simply click the fire button five times to turn it on and off. The passthrough feature allows you use the battery while it's charging. These batteries were created using a Li-polymer cell, making them the safest models available and allowing you to vape with confidence. Unscrew the atomizer at the middle. This will reveal the bowl coil head. Reconnect the two pieces of the atomizer by screwing them back together. Connect to your favorite eGo battery and enjoy your vaping experience. When charging the passthrough battery, keep in mind that though you are able to vape while charging, the battery should only be plugged in for 3 hours at a time. Also, only use the charging cable included with your battery. Using any other charger can damage the battery.